Or to be more correct, the AlgLib Cash-Karp Solver, Cash-Karp being a refinement of the Runge-Kutta method of solving ordinary differential equations. 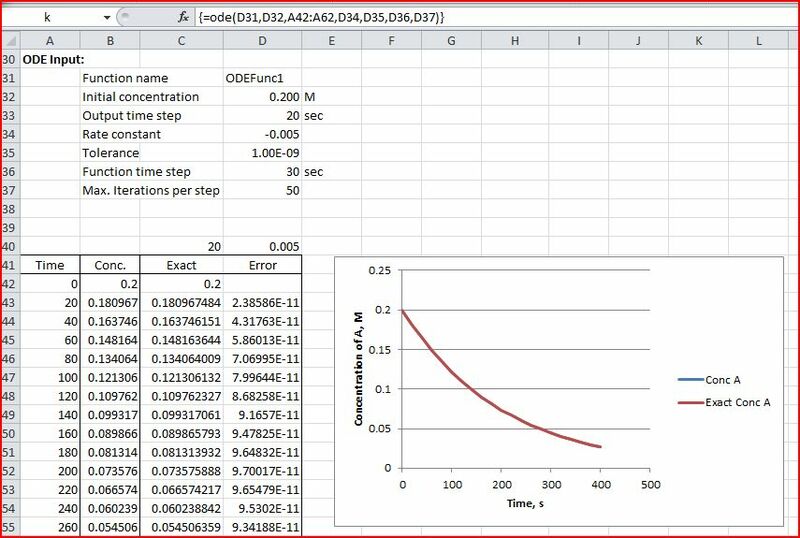 Read the name of the ODE evaluation routine and the required input data from the spreadsheet. Convert data in spreadsheet ranges to variant arrays. Convert variant arrays (which will always be base 1, 2 dimension arrays) into the form required by the AlgLib routines, which will always be base 0, and may be 1 or 2 dimensional. Loop through the AlgLib solver routine and the external ODE evaluation routine until the solver routine returns “False”, which indicates that it has finished. 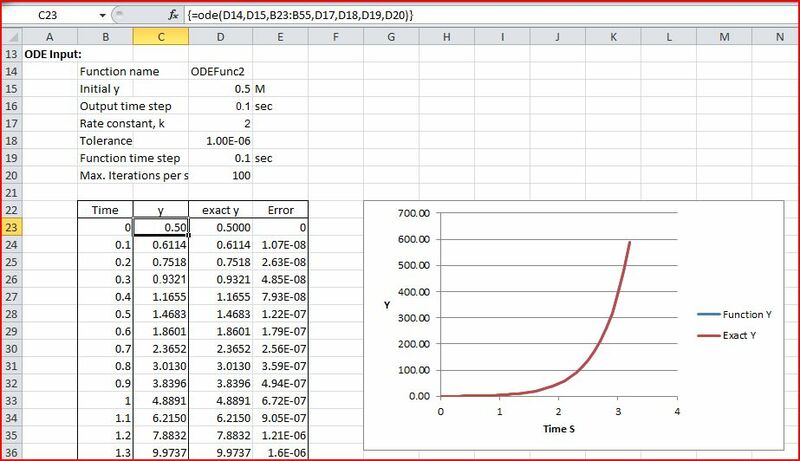 The VBA function named in “FuncName” is called using the Application.Run method. 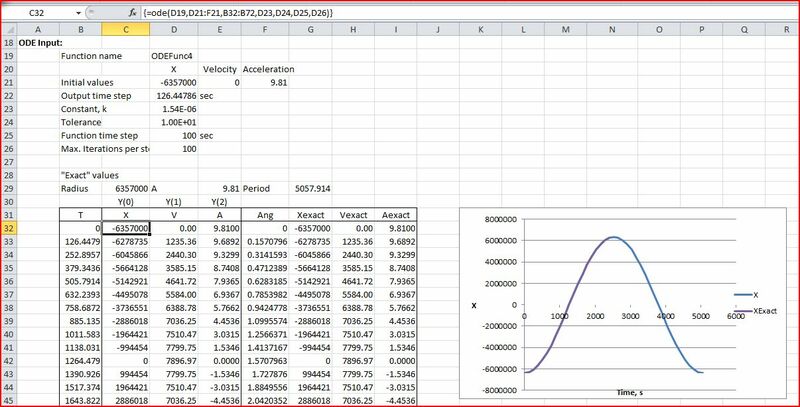 If necessary convert the AlgLib output arrays to a form suitable for Excel. Assign the output array to the function return value. This process is illustrated in the code for the UDF ODE() shown below (may take some time to display correctly). This code and all the related AlgLib and other routines are included in the file ODESolver.zip.
' 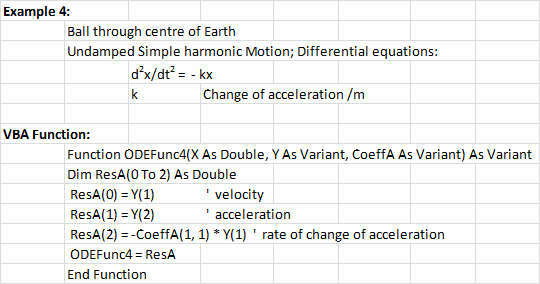 ODE evaluation routine, followed by the required input data.
' routines, which will always be base 0, and may be 1 or 2 dimensional.
' which indicates that it has finished.
' 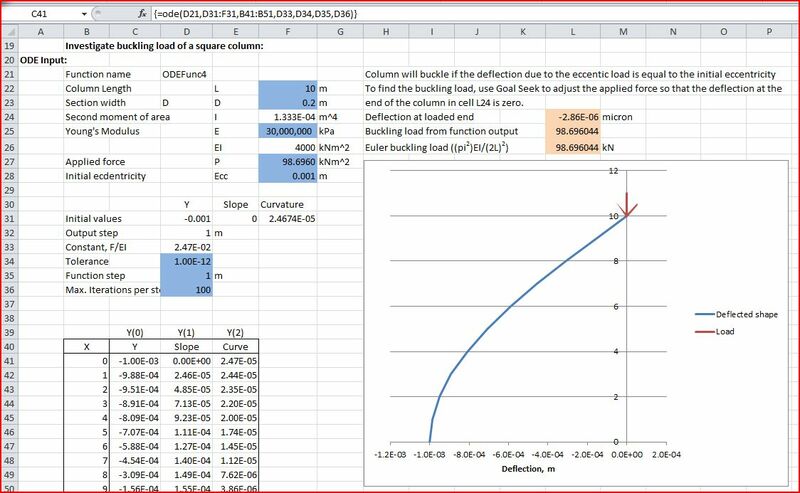 function return value without further processing. 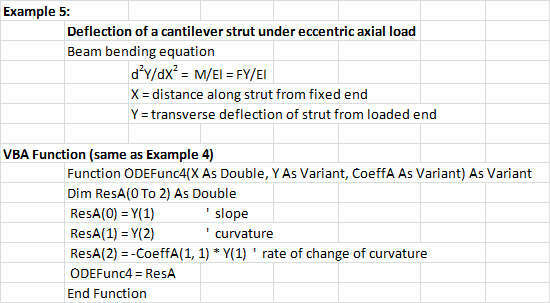 This entry was posted in AlgLib, Beam Bending, Differential Equations, Excel, Maths, Newton, UDFs, VBA and tagged AlgLib, buckling, Cash-Karp, differential equations, Excel. VBA, hole through the middle of the earth, Runge-Kutta, SHM, UDF. Bookmark the permalink. thanks for this post, which for single ODE replaces the XNumbers ODE solver. Miro – it looks like my previous response was wrong! and also response to your comment at the XNumbers post. 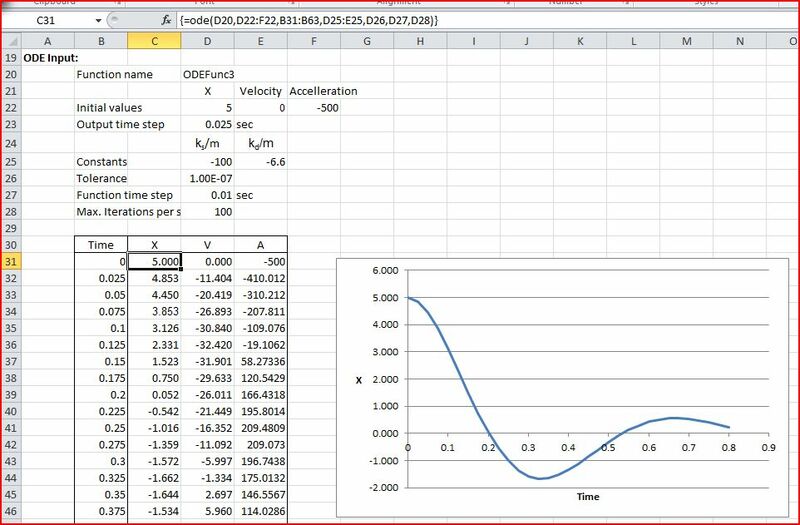 By modifying it Can I use this script for time variable spring and damping coefficient? It is some time since I worked on this spreadsheet, but I think the answer is yes. 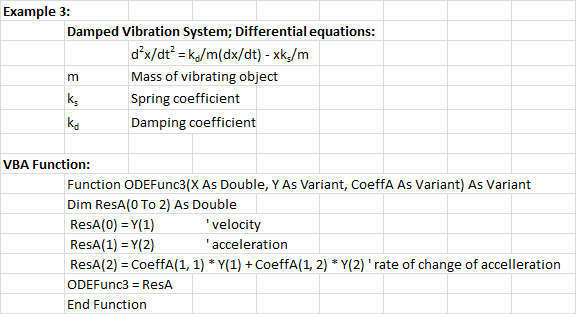 If the spring and damping coefficients are just linked to time you can add that into the ODEFunc3 VBA routine. with w=(2pi/v)v’ where v=v(t) is given by a data Feed.